Anonymous sale, in these Rooms, 13 April 1989, lot 132 (£17,600). This form of bergere chair corresponds to a design illustrated in Thomas Sheraton's Cabinet Dictionary of 1803, plate 7 and described as a 'Curricle' chair. Sheraton's chair design is further embellished with lion's heads and paws. Thomas Hope also illustrates a similar bergere in his Household Furniture and Interior Decoration, London, 1807, pl. XXVI, no. 5. 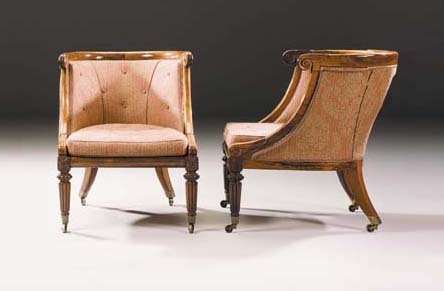 A related pair of bergeres was sold anonymously, Sotheby's New York, 21 January 1995, lot 411 ($31,050).